Travel into a mystical world of magic, as you spin the reels with Merlins Millions Superbet Slots. Merlins Millions features an amazing theme borrowed from the legendary tale of a wizard and is endowed with the highly rewarding Superbet feature. These are games that can be played here at Casino UK using casino no deposit. Play Free Merlins Millions Slots With Casino No Deposit Bonus – Join Now! At Casino UK, we offer our new customers a free casino no deposit bonus of ₤5 to get started with. Simply open an account with us and get an instant casino no deposit bonus credited to your account. Play free Merlins Millions Superbet Slots game and other exciting slot games without any risk. This casino no deposit bonus from us will enable you to try out games without making any deposit and help you get the real feel of placing a bet. The winnings that you can earn from it are yours to keep. You can withdraw your winning after you satisfy the wagering requirements and terms and conditions of our bonus. The Merlins Millions Superbet Slots is centred around the great wizard Merlin, whose job is to protect the great King Arthur and the entire kingdom from evil entities. Watch as Merlin utilises his magical powers to recompense players with a swing of his magic wand. This game is a 5 reel with 50 payline video slots developed by NextGen Gaming. NextGen is well-known for its innovative slots and user-friendly gaming experience. The vivid graphics and captivating sounds of the game complement the theme. Encounter magical symbols of Spellbooks, Merlin, Owl, Magical staff, magical potions and Poker cards. This slot game got so popular that it was even followed by a sequel to it. The most rewarding and entertaining highlight of the Merlins Millions Superbet Slots is its Superbet function. You can activate the Superbet feature anytime of the play by clicking on the Superbet button that is located on the right side of the control panel. All you need to do is place an extra wager with each spin. Depending on the level of the Superbet wager, it will apply a bonus multiplier to your winnings ranging from 2x to 10x. If you wish to maximise your winnings, simply go for an additional wager with the Superbet feature and earn a chance to win more. There also free spins up for stakes when you play. Merlin is the wild symbol that will be the substitute for other symbols, except for the scatter and bonus symbols. The free spins get triggered when 3 Scatter symbol of Magical orbs appear on the reels. Earn up to 5 free spins and maximise your chances of winning. In this round of free spins, the Merlin wizard will come to your help and cast a spell to turn some random symbols into stacked wild symbols to further increase your chance of striking a win. During the free spins mode, if you hit 3 or more Scatter symbols again, it will enable more free spins for you. In addition to this, when 3 or more owl symbols appear on the reels, it will activate the bonus round of this game. During this bonus round, all symbols will turn into magical owls and all you have to do is to click on them to reveal your prizes. Collect as many prizes as you can with the Merlins Millions Superbet Slots bonus round. Merlins Millions Superbet Slots is compatible with Windows, Linux and Macintosh. It is also available for mobile play with no download required to play. Simply access the Casino UK site from your mobile and play the Merlins Millions Slots from your mobile at any time you want. Casino UK is compatible with Android, Blackberry, Windows, iOS devices and offers you the great convenience of playing from your mobile phones. You can even make a mobile deposit by using your phone credit. Deposit by phone bill is a user-friendly feature adopted by Casino UK to enable easy and quick payments right from your mobile. So, what are you waiting for? Try the Merlins Millions Superbet Slots game now with your free casino no deposit bonus. Sign up with Casino UK and get your free bonus now. 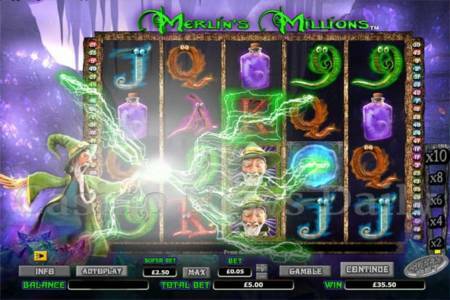 Let the great wizard Merlin help you win great riches.